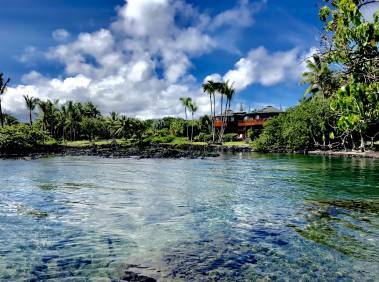 I grew up on the Big Island, in charming little “Hilo Town”. As a kid, you’d likely find me playing in the waves at Honolii, Pohoiki or Waipio valley. I have fond memories of walking to the beach barefoot - the smell of smashed guavas on the road is easy to recall. I witnessed Miami recover and rebuild. It was one of the first markets to rebound, largely due to foreign buyers. I worked with people from all parts of the globe, as colleagues and customers. And, traveled extensively for study, business and (my personal favorite), for pleasure. I became curious about the world until finally, I couldn’t take it. I had to know how the world worked from a macroeconomic standpoint. And, I wanted to understand the “language of business”. So, I went back to the University of Florida and got my MBA. If I had to pick a 3rd thing I’m thankful for, (though there are many), I’d have to say I’m happy to be home on beautiful Big Island, working with my Mom and sister as part of “Team Nakanishi” at Hawaii life. There is really something magical about these islands; and, this Hawaiian girl is excited to help you find your very own piece of aloha.